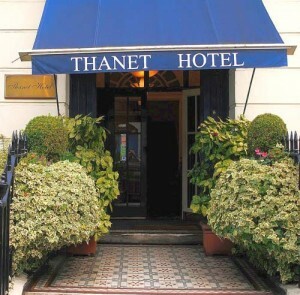 The Thanet Hotel has a brilliant location. It is situated on a quiet Georgian terrace with parks at either end. However, we are really close to London’s major attractions. The British Museum, West End, Oxford Street and Covent Garden are all within walking distance, as is London’s famous theatreland. A short underground or bus journey takes you to the City, St Paul’s Cathedral, Westminster Abbey and Harrods to name just a few places. The Thanet is close to Russell Square and Holborn underground stations which are served by the Piccadilly line and Central line. You will be able to get to most places without even changing lines. Take the underground Piccadilly line to Russell Square (1 stop). Alternatively you can catch a taxi which will cost between £6 and £10 depending on the time of day.